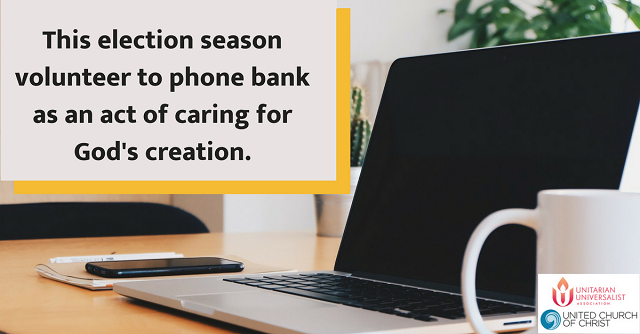 There is a non-partisan and vitally important way that people of faith can make a difference this election season: phone banking. Just as one might volunteer at a food bank as an act of faith, one can phone bank as well. In this case, you can volunteer from the comfort of your own home. All you need is a computer and a phone. The United Church of Christ Environmental Justice Ministry and the Unitarian Universalist Association Green Sanctuary Program are partnering with the Environmental Voter Project to give people of faith the opportunity to encourage others to vote and vote their values. At notable rates, those who care about the environment fail to vote compared to the rest of the population. This translates into candidates who care less about the environment than they might otherwise. All of this can change when those who care about the environment receive a phone call or text reminding them to vote. I invite you to join me for a two hour webinar on September 18. We'll receive one hour of training and then volunteer for the remaining hour to call or text potential voters. Register now!